Service-learning provides one of many opportunities for students to learn leadership skills. Walden sponsors three Kiwanis Club of Louisville - sponsored service clubs: K-Kids, Builders Club, and Key Club. Other leadership opportunities include classroom group work, participation in Kentucky Youth Assembly, Jr. KYA, Kentucky United Nations Assembly, Jr. KUNA, Student Council, National Honor Society, Jr. NHS, a variety of clubs, high school service-learning Capstone project, etc. Walden considers its commitment to community service an integral part of the school's overall educational philosophy, program, and curriculum. 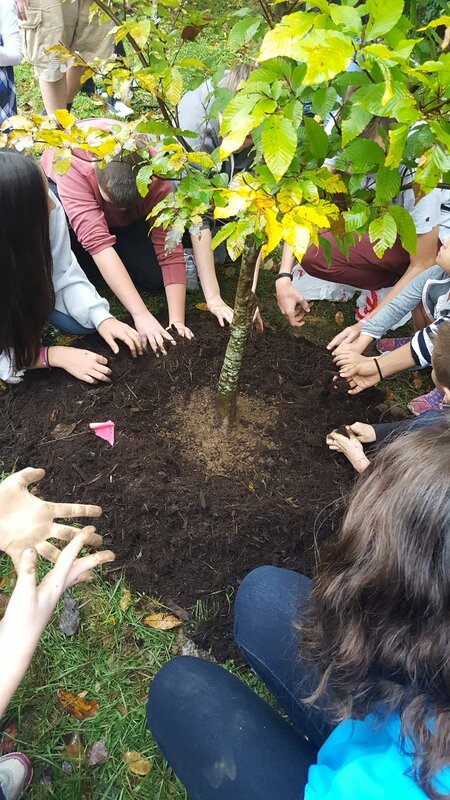 Walden’s service learning activities foster community service, compassion, reflection, and collaboration, supporting the school’s core values of community, respect, and responsibility. By giving of ourselves, we gain a fuller understanding of what it means to be part of a larger community. Through individual, small group, and school-wide acts of service, we help all members of the Walden community develop the belief that giving back to those in need is a lifelong responsibility. Each semester, one school day is devoted to service learning. Our high school goes off campus, while the lower and middle school divisions collaborate on projects to aid the school and the greater community. This fosters collaboration among divisions and students and partnerships between school and the local communities. K-Kids Club is a Service Leadership program affiliated with Kiwanis International that provides an opportunity for Walden fourth grade students to give back to their community and serve others. K-Kids meet monthly during the school day to plan events and fundraisers. Some of the fundraisers include: Babysitting afternoons for K-2 students, selling glow items at the school’s Monster Mash, and the Cutest Pet contest. The funds generated from these fundraisers go to help community organizations such as Kosair Children’s Hospital, The Humane Society, and Wayside Christian Mission. The lower and middle school homerooms collaborate on projects to aid their school and the local and global communities. A few of the organizations assisted in the past include: nursing homes, US troops (care packages), Dare to Care, Kosair Children's Hospital, and VA hospitals. On the fall service day, students reaffirm their commitment to Walden’s Compassion Resolution. Builders Club is a service club open to students in grades 5-8. The club meets twice per month to plan service events and fundraisers. The club participates in Me to We (“We Day”) by performing one local service project and one global service project. The global project requires research and formal presentations by the club’s Charity Committee, and funds raised by the annual Cupid Grams sale are donated to that selected charity. Some of the organizations they have supported in the past include Dare to Care, World Food Program, and Global Fund for Women. Students who maintain a high GPA are invited to join the JNHS. Each member is required to perform ten hours of local community service and serve as leaders within the school community by demonstrating good citizenship. One of the many organizations they have supported in the past includes Blessings in a Backpack. Walden High School students have an obligation to fulfill community service requirements. Each student is required to perform 20 hours of community service annually. In addition, each graduating student is required to complete a Service Learning Capstone Project. Admission into the NHS is based on high GPA, a formal application, and rigorous review by a faculty committee. Once admitted, each member commits to service-related leadership role. NHS organized the high school’s Day of Service. One Friday each semester is devoted to a Day of Service off campus. The High School works together as a whole and volunteers a day of physical labor. The High School has worked at Jefferson Memorial Forest, The Americana Center, Caperton Swamp, and Yew Dell Botanical Gardens. At Walden, we are committed to demonstrating compassion. Our Service requirement is one way that students can practice and build their own compassion. Walden High School partners with Mobile Serve to report and track service hours. Not only does Mobile Serve streamline our service reporting, but it also provides students with a robust portfolio of their service that they can use in various applications to organizations and colleges. If you are a new student to Walden High School, please read through the Mobile Serve Start-Up Guide to get started. The Capstone Service Project is a project completed in the last year at Walden. You are responsible for planning, executing and presenting a project that fulfills a need at Walden or in the greater community. During this project, you must spend at least 20 hours in the service of others. No other service hours are required of you during your senior year; however, you may still submit hours if you would like to go for the 100 hour Outstanding Service Award. The service project may take a variety of forms. It should be meaningful to you and meaningful to the community. Y-Club - Each member commits to extra service hours. Walden participates in the Y-Club affiliated programs– KYA and KUNA– to foster leadership and civic and global citizenship. KIVA - Kiva is a non-profit organization with a mission to connect people through lending to alleviate poverty. Leveraging the internet and a worldwide network of micro-finance institutions, Kiva lets individuals or groups lend as little as $25 to help create opportunity around the world. Girl Up - Girl Up is a campaign partnered with the United Nations to support its programs in several developing countries to give girls an equal chance for education, health, social and economic opportunities, and a life free from violence.